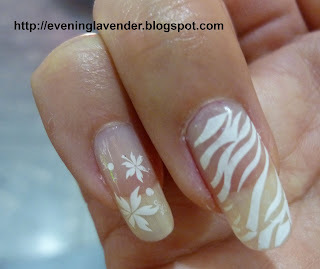 Today I will show you the result of my Konad stamping. Sorry, I do not have the photo of the plate here as I forgot to snap the photo at the shop. 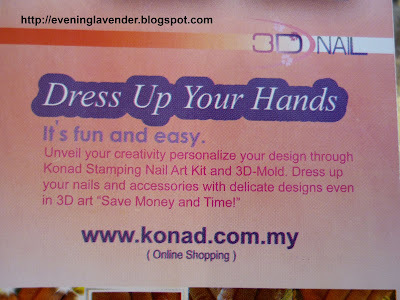 I did not purchase the Konad stamp plate as I was in a hurry for another appointment. There are so many plates to choose from. You can click here to see the various plates. 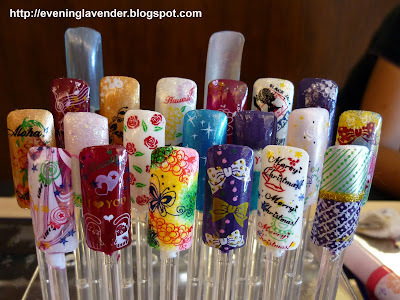 Some of the designs that the girls made using Konad stamps. The outlet that sells the Konad plate is located at Isetan, the Gardens. It is right at the end after the shoes. The girl at the outlet requested me to paint her nail and draw flower for her. Konad stamping? I wanna get some! 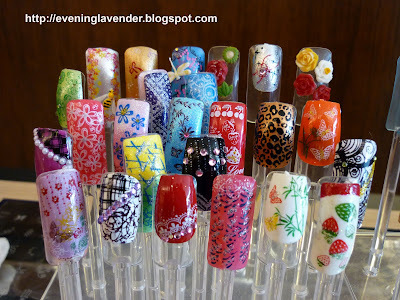 Looks pretty and easy to do oo.. By the way, are you going to the upcoming workshop? Yes, those stamping the girls did are eye popping indeed. Thanks witoxicity for appreciating my hand painted nail art. I love to paint compared to stamp, its faster. Stamping is slow because have to clean the stamp and plate after every stamp.